Hawk Warrior, famously known as one half of the Road Warriors, isn't known for his success as a singles wrestler. A 17 time tag team champion, The Road Warriors were one of the most dominate tag teams in wrestling history. In 1992, however, Animal had a career ending (at the time) back injury that led to Hawk having to wrestle without his friend for the first time in nine years. Hawk had challenged for the NWA Heavyweight Championship previously but the vast majority of his fans knew him for his tag team skills. Hawk would travel throughout the world and even won the CWA World Heavyweight Championship (a German promotion) in 1992. He spent a lot of his time from 1992 to 1995 in New Japan, wrestling with Kensuke Sasaki as the Hellraisers. By 1995, Keiji Mutoh was one of the top stars of New Japan and had defeated Shinya Hashimoto a few months earlier for the IWGP Heavyweight Championship. It was his second reign with the championship, and Mutoh had firmly set himself (along with his other Musketeers) as both the present and future of New Japan Pro Wrestling. Mutoh had defeated Hiroyoshi Tenzan a month prior in his first defense, and his second defense was against the legend Hawk Warrior. This was Hawk Warrior's first attempt at the IWGP Heavyweight Championship, but he was a two time IWGP Heavyweight Tag Team Champion (with "Power Warrior" Kensuke Sasaki) and a very respected wrestler in New Japan. Leading up to this match, Hawk was already slowly phasing out his Japanese tours as he planned a return back to WCW. In May of 1995 he had wrestled on a WCW event and by the end of 1995 he was back in WCW on a more regular basis. But before he left, there was one last thing he needed to do: win a major singles championship in Japan. The match was held at the Nakajima Sports Center in Sapporo, Japan. This was the 3rd title defense held at the arena, and up to this point no IWGP Heavyweight Championship title changes had taken place in the building. 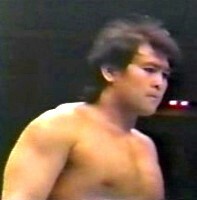 Hawk was a popular wrestler with the fans as was Mutoh, leading to a hot crowd. The stage is set. Hawk Warrior comes out first and poses in the corner, wearing his full gear. As Mutoh's music starts the crowd begins to clamor, and with the small walkway fans from each side are able to give him an encouraging pat on the back. The match is declared, the bell rings, and we are under way. They circle each other to start, tie-up, waistlock by Mutoh but Hawk muscles out of it. Tie-up, side headlock by Mutoh and he takes Hawk to the mat. Hawk reverses it with a headscissors but Mutoh gets out of it and both men are back to their feet. Tie-up again, side headlock by Mutoh, Hawk Irish whips out of it but the two collide with no result. Dropkick by Mutoh and he delivers a backdrop suplex, but Hawk pops back to his feet. Face crusher by Mutoh, but again Hawk gets back up and stares at Mutoh. Tie-up, and they go into a Test of Strength. Kick to the stomach by Hawk and he chops Mutoh in the chest. Irish whip by Hawk to the corner and he follows with a lariat. Hawk punches Mutoh in the corner, Irish whip, but Mutoh moves when Hawk charges in. Irish whip by Mutoh, reversed, but Mutoh delivers a dropkick. The second one knocks Hawk off his feet, Irish whip by Mutoh, reversed, and this time it is Hawk that hits the dropkick. Mutoh rolls out of the ring, Hawk goes after him, but Mutoh quickly rolls back in. Mutoh attacks Hawk as he comes through the ropes, Irish whip, but Hawk kicks him when he goes for a back bodydrop and connects with a lariat for a two count. Scorpion Deathlock by Hawk but he lets it go and rams Mutoh's knees into the mat. Hawk applies a reverse chinlock with a body scissors, but he releases it after a moment, Irish whip, Mutoh goes for a sunset flip by Hawk punches him in the face to block it. Irish whip by Hawk and he delivers a jumping shoulderblock. Stretch hold by Hawk and he re-applies the body scissors. Hawk clubs Mutoh in the chest while keeping the hold applied, but Mutoh rolls out of it. Back up, headbutts by Hawk, Irish whip, drop down, and Hawk nails the big boot. Hawk applies the body scissors again and then goes for a modified cross armbreaker. He wrenches on Mutoh's arm before picking him up, Irish whip, and he hits a second jumping shoulderblock. Fist drop by Hawk, cover, but it gets a two count. Hawk picks up Mutoh and slams him to the mat, he then goes up to the top turnbuckle but Mutoh rolls out of the way of the diving knee drop. Mutoh begins twisting on Hawk's now injured knee, figure four leglock by Mutoh, but after a minute Hawk gets a hand on the ropes. Mutoh waits for Hawk to get up, Irish whip to the corner and he hits the cartwheel elbow smash followed by a dropkick. Hawk rolls out of the ring but Mutoh goes out after him and throws him into the railing. And in the end, Hawk Warrior couldn't overcome the champion. He learned the hard way that battling the best of New Japan Pro Wrestling is more difficult when there isn't a partner to tag in, and Hawk was noticeably frustrated in his failure to pick up the pin which lead to him making a high risk mistake. To his credit, he was hard to keep down as Mutoh had to do two moonsaults and a rare missile dropkick to manage to barely pick up the three count on the Road Warrior. Even though he lost, the match was a success for Hawk has he put up a fight against the best New Japan had to offer, but he was simply a little out of his element which helped lead to his downfall. 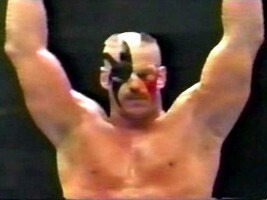 After this event, Hawk Warrior would continue wrestling for New Japan through the fall before returning to WCW. Animal Warrior recovered from his injury and would re-join with Hawk, and they would team together until Hawk's passing in 2003. It wouldn't be Hawk's last stint in Japan, as he wrestled for both All Japan and World Japan later in his career. Mutoh would go on to defend the title successfully three more times before losing the title to Nobuhiko Takada at the 1/4/96 Tokyo Dome event.